TNR -- TV News and Reviews: Lost -- "Follow the Leader"
Ageless Others "advisor" Richard Alpert is shocked as the gun-wielding Daniel Faraday (Jeremy Davies) gets shot in the opening of tonight's Lost episode "Follow the Leader". *SPOILER ALERT* Tonight's episode of Lost, "Follow the Leader", brought us two incredibly jaw-dropping events, both involving the recently reincarnated John Locke (Terry O'Quinn). 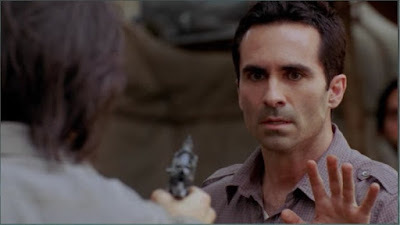 The first event was that Locke's return, precise knowledge of when time loops would occur, and his decision to bring all of the Others to see Jacob completely freaked out the freaky ageless man himself, Richard Alpert (Nestor Carbonell). Seeing Richard actually frightened, confused, and apparently out of the loop of information was more disturbing than smoke clouds and polar bears in the jungle, I can tell you. And then after Locke makes all the right noises to reassure Sun of his efforts to reunite her and her husband, he casually tells Ben (Michael Emerson) that he has no interest in reuniting with anyone. He's going to see Jacob to kill him. And in that moment of utter shock and horror on Ben's part, we the audience actually fear Locke more than Ben--and we actually wonder if we should be siding with Ben on this one. Now that is some stellar mind-frakking TV. Speaking of mind-frakking, "Follow the Leader" definitely made the brain twitch with having Richard appear in three separate time lines--the "present", the 70s, and in one of Locke's time jumps. The fact that he magically appeared when Locke needed his help with his bullet wound is due to the fact that future Locke told him what to say and do...again, watch the brain cells fry. Our other journey in "Follow the Leader" was the split between Jack (Matthew Fox) and Kate (Evangeline Lilly) over whether to follow Daniel's advice to detonate the hydrogen bomb. Jack is in a big hurry to erase the last three+ years of his life, but Kate is rightly worried about making important relationships just disappear. Never mind the fact that if the plane had landed as scheduled, she'd be going to prison. Jack seems to convince Eloise (Alice Evans) that Daniel was in fact her son and that she might be able to undo killing him by following his orders to alter this timeline. Sayid (who pops out of the jungle long enough to save a departing Kate from getting shot by the Others) suggests to Jack that Eloise's only interest in the H-bomb is to blow up all of the Dharma folk. Jack doesn't really care--he's a man on a mission, now. Sayid's more of a fatalist about it all, and goes along with the plan. Then we have Sawyer (Josh Holloway) and Juliet (Elizabeth Mitchell), held captive by the Dharma security personnel. Once they started beating on Sawyer, and asking for Kate's whereabouts, I could see it all coming. Sawyer had to make a choice between Juliet and Kate. 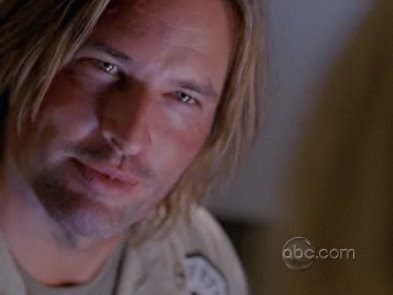 As he should, Sawyer chooses Juliet, bargaining a spot for them on the departing submarine in exchange for information. I realllly didn't like this, but I guess it follows one of two paths--one is that the Sawyer we knew from the beginning was always out for his best interests, and now it's his and Juliet's interests, and second is that we don't actually know if Sawyer gave them accurate information or if he just played them to get a ride off the island. Sawyer and Juliet had a nice scene together, of renewed faith and trust in one another, and then of course--who drops in but the newly returned/recaptured Kate to throw a wrench in the works. So the love triangle complications continue. Another item of note is that Miles (Ken Leung) finally sees for himself that his father Dr. Chang (François Chau) sent him and his mother away to save them--and that the only way he could get her to leave was by being cruel to her. Next week is the season finale of Lost, and I'm not sure my brain can handle it. We've got a possible murder of Jacob, the detonation of an H-bomb, a submarine heading to the real world in the 70s, and Hurley, Miles, and Jin at a loss for their next move out in the jungle. 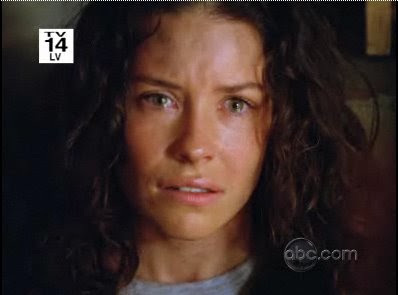 Watch the three hour season finale event of Lost, next Wednesday night on ABC starting at 8/7c. PHOTOS: Nestor Carbonell as Richard Alpert, Evangeline Lilly as Kate, Josh Holloway as Sawyer, and Elizabeth Mitchell as Juliet in Lost, "Follow the Leader", c2009 ABC Studios. Mind frakking, indeed! My head is still going boing-boing-boing! I think you hit the nail on the head with the screencaps, capturing the emotional high points of the episode -- Juliet's death glare, Sawyer's lovey-dovey eyes, and Kate's anguish. I think that Sawyer did revert back to his self-centered days, even if he did mislead the Dharma folk, which I would guess he did. What about Miles, Hurley, and Jin, who were waiting for him? Did he even think of them? I guess we'll find out next week. I thought that not only did Richard seem diminished and frightened and confused, but Ben did as well. And I think that spells trouble! The finale should be VERY interesting!